It’s fair to say that I’m fanatical about bikes and everything to do with the sport of professional cycling. Perhaps becoming even more obsessed with it over the past few years since reaching the ripe old age of forty, I have begun to analyse the sport – the philosophies and approaches of the various pro teams – in more detail than ever before. 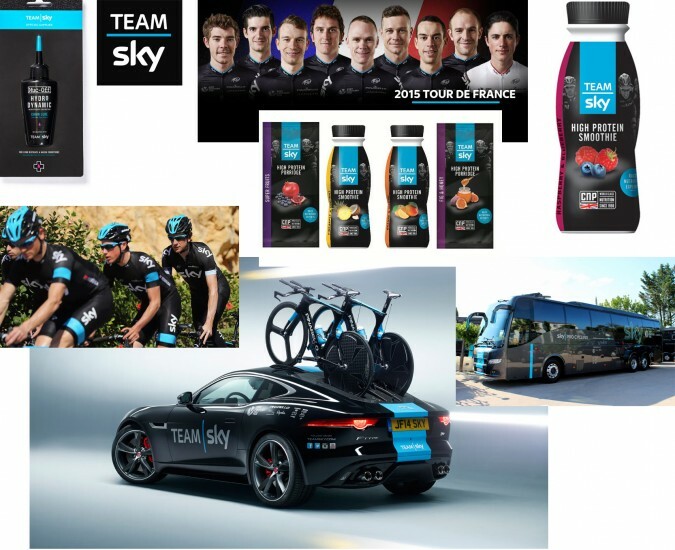 Interestingly, the sport, and Team Sky in particular, has much to tell us about brand marketing. 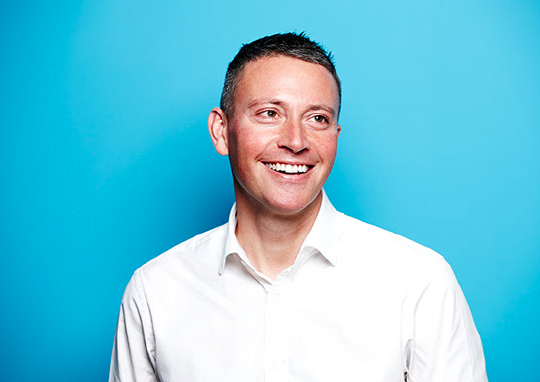 Since 2012 when Sir Bradley Wiggins became the first Brit to win the Tour de France, the Team Sky brand – that blue stripe on a black background – has become a familiar sight as cycling enjoys a resurgence in popularity. It’s an appealing ‘visual identity’, certainly, and transfers beautifully from cycling wear to tour buses and all manner of merchandise. But its power lies in the emotive story of ‘the line’. In creating The Line, Team Sky has broken the mould for sponsorship in pro cycling. Pro cycling, like Formula 1, is famed for its mass of sponsorship from banks, telecoms, lotteries and supermarkets. (Sponsorship is critical in cycling – as none of the revenue generated from TV rights filters its way down to the actual teams). However, until Sky got involved, sponsorship meant little more than wearing a big company’s logo on the team clothing. Never before had a stand-alone ‘brand culture’ been developed in pro cycling with the sole purpose of encapsulating an entire team, its ethos, its performance and the way it moulds its complete competition strategy. Unless you read the marketing industry press, this brand story is likely to have passed you by. And that’s the interesting point. Team Sky have sought to build their brand FROM THE INSIDE. It’s a story which is meaningful to everyone who is part of Team Sky, whether they are riders, mechanics or medics, and creates an ethos for the standards expected of everyone who contributes to the team. 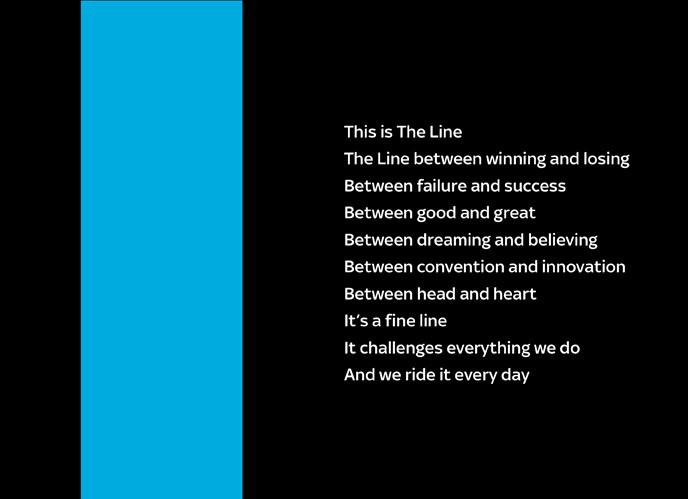 No doubt Team Sky’s supply chain is very well briefed on The Line, and feels inspired and empowered to play their part in the overall success. In this respect, it’s the perfect example of a brand which does more than build recognition, and actually plays its part in carrying an organisation towards its goals. Because of this, Team Sky’s brand wasn’t de-valued by the team’s disappointing performance in last year’s Tour de France. And initiatives such as Sky Ride are more popular than ever. To the outside world, Team Sky is now unarguably a performance brand in its own right. The brand fuses its visual identity with its underlying brand ethics, and is becoming an aspirational brand for sport enthusiasts, sitting comfortably, particularly in the cycling domain, alongside the established global sports apparel brands. It’s a huge success story over a relatively short space of time. And one which, much like the line-up for Team Sky in this year’s Tour de France, doesn’t show any signs of slowing down. Next month: We’ll be looking at the ‘aggregation of marginal gains’, the winning strategy adopted by Sir Dave Brailsford in preparation for the 2012 Tour de France. helping to save endangered species around the world from extinction. If you would like to sponsor them, please click here.